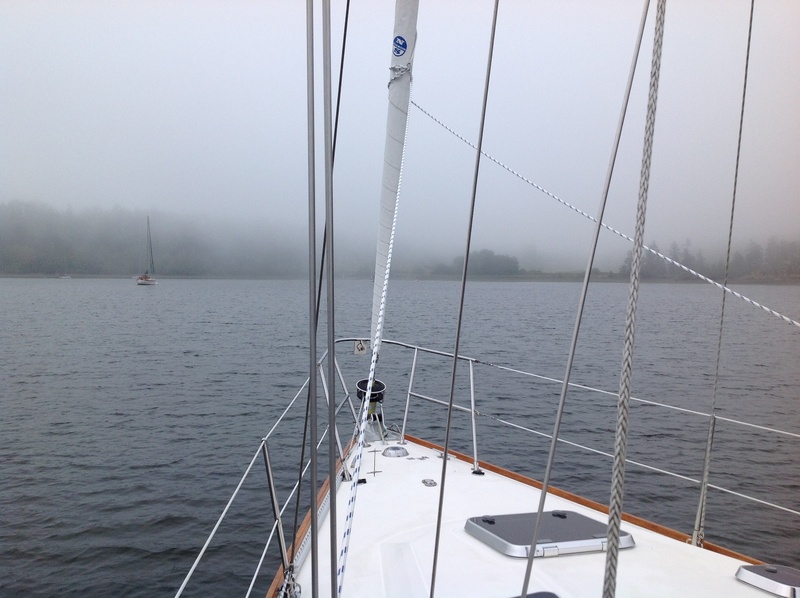 Silk’s Post #45 – At this moment, I’m on our sailboat lying on the hook in an anchorage in the San Juan Islands called Blind Bay. I know exactly where I am. Not just from looking around at my surroundings, or consulting the chart. No, I mean I know exactly where I am on the planet through the magic of our boat’s Global Positioning System. A bunch of satellites orbiting the earth are telling me where I am, precisely … within a few feet. Just stop for a moment to think about this man-made miracle. GPS is now so common, it’s even available on your cell phone. Getting lost is actually becoming hard to do. What I really wish I had was a writer’s GPS to tell me where the hell I am in my story at all times. Maybe, like me, you’ve come to a place occasionally in your first draft where you find yourself looking over the edge of the story world into a void, wondering how you got there and where to go next to avoid the waiting dragons. If you’re a writer, it often feels like everything you experience turns out somehow to be about writing. So it was for me at 9:30 this morning when we sailed out of the Pacific Northwest’s version of a Victorian seaport village called Port Townsend. Fog and low cloud reduced visibility to 500 feet, and the wind was still. We had a course plotted, and a destination in mind, but everything on the sea is subject to conditions. The skipper may command the helm, but Neptune and Boreas command the elements, and the weather, winds, currents and seas are infinitely more powerful than any mariner in any peapod of a vessel. As we blindly steamed out into Admiralty Inlet, skirting the notoriously fickle tides off Point Wilson (today showing its gentle side), I quickly lost sight of land. I knew where I was – GPS told me that – but I could see no visual evidence of it. Nothing but fog. We were moving forward on faith (in technology, the modern god), surrounded by the small, watery world that fell within the limited circle of our vision. There was occasional evidence of a bigger world outside our bubble. A foghorn. Kelp mats that materialized out of the fog just feet ahead in our path. Low, undulating swells from the Pacific that sent the boat rocking like a cradle, throwing gear against bulkheads in slow motion. A deep warning whistle from the shipping lanes. Suddenly visible rafts of small black murres, who dove underwater en masse at our approach. The gong of a channel marker buoy. Churning along across this blank canvas, I flashed on the analogy between the voyage and my writer’s journey through the book I’m working on. I know where I started, and where I want to go. I have a sense of the waypoints I must pass to get from Point A to Points B, C, D, and so on. But I can’t yet “see” the whole story. A lot of it is still like a fog bank – insubstantial but impenetrable to the eye. A lot of the story voyage will be dictated by the conditions I find along the way. Currents, obstructions, hazards. And at the end, I very well may find my course has taken me to an unexpected destination. By 10:30 the visibility was a quarter mile, and I was able to see some of the waypoint buoys on our course as they appeared briefly out of the fog, then melted away again. We made good time with a favourable current, but it felt like we were standing still for hours, with no visible scenery to mark our passage. We were marching in place, still surrounded by the tiny blank canvas world of our limited vision. Then, at 11:30, we saw our first hint of land. Little Smith Island. Just a ghostly smudge off to port at first, a defined shape where no horizon had existed. As the sky became a brighter white, edges sharpened and soon the line between land and sea revealed itself in shades of gray. By 1:00, we had colour. The blurry gray lumps looming up from the ocean became green-clad slopes and the sky began dissolving to blue, tinting the water itself. My log entry for 1:30 reads “skies clear, sun out”. Not poetic, but to the point. The effect of this visual transition on the journey was, of course, profound. I knew exactly where I was throughout the passage, but it wasn’t until I could see it with my own eyes that I had a sense of actually moving forward – of getting somewhere. This is a simple story with no tricks, no clever punch lines, no huge surprises. However, the experience – and the analogy to my writing journey – had a clarifying effect on me. It made me think about the “writer’s GPS” I have in my own head (we all do). It’s also called “instinct”. Maybe getting through the fog of a first draft requires you to have faith that you’re making progress toward your plotted destination, even when you can’t always see that progress in glorious technicolor. If you start with a course in mind (whether you’re an outliner or a choose your route more organically), eventually the blank canvas will be filled in with rich detail, and your story will come alive. You may not follow your originally plotted course exactly, but the thing is to just keep moving, keep writing, trust your instinct and try not to get lost at sea or hit any rocks. Maybe when the sky clears and the sun illuminates your storyworld, you’ll find you’ve discovered a new continent. This entry was posted in Completing a Novel, first drafts, Outlining, Plotting and tagged first drafts, Fog, getting lost, Instinct, Outlining, writer's journey by Silk Questo. Bookmark the permalink. Thanks for your thoughts JM. The good thing in writing is you can retrace your steps and change what must be changed … The only real consequences to making mistakes is more work. When sailing a boat, you can actually sink. So write fearlessly! Great visual images, Silk. Being a sailor through and through, you must include some of these great scenes and settings in your new novel. It’s only natural. And I can relate about not following the originally plotted course. That’s one of the perks of writing, the freedom to veer off and explore what lies ahead in uncharted waters. Just as in sailing, it might get us in trouble, but it sure makes for an exhilarating ride. Maybe that’s one of the things that attracts us to writing: the freedom to get ourselves in trouble, and then back out (without nasty consequences like, um, let’s say jail time, or bankruptcy, or the worst of all … Embarrassment).